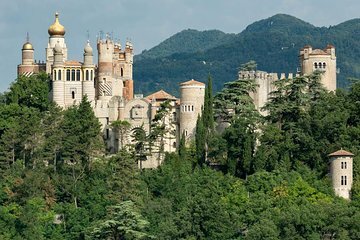 Discover the curious history and dazzling architectural mashup of Rocchetta Mattei, a mountain castle straddling Tuscany and Emilia-Romagna. Learn about its inventive creator, Count Mattei, and the illustrious guests who walked through its doors for cutting-edge healing treatments. A guide leads you through secret passageways, courtyards, and grand halls while revealing the hidden symbols of this one-of-a-kind estate.